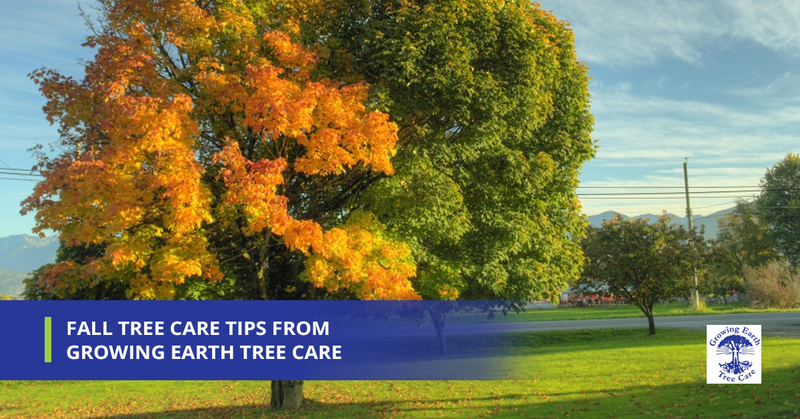 Today’s post is dedicated to discussing autumnal tree care tips. As a tree care provider to residential and commercial clients throughout Northern Virginia (and beyond) for over 40 years, we want to set our clients and prospective customers up for success in any way we can. If you are looking for information about where and how to plant trees, how to care for mature trees in particular, and a host of other useful topics, be sure to check out our history of posts here. We are certified arborists, have an A+ rating on the BBB, and are an accredited member of the Tree Care Industry Association. As long as we are hitting you with quick-fire random facts, we might as well let you know that we give away free wood chip mulch for anyone who is interested! Just fill out the signup form here. Keep in mind that in order to keep this a complimentary service, we are obligated to inform you that you need to take a full truckload of wood chip mulch. However, we bring the mulch to you! Not bad for a free service. Let’s get to the reason you are here, in all likelihood. With it already cooling down a bit, it’s wild to think that the fall is right around the corner. For new homeowners who have new yards and therefore new trees, this might be the first time you’ve considered tree care in reference to the changing season. Is pruning appropriate? If so, how much? What tools do you need to perform basic tree maintenance? When should you call in professionals for tree service? We will do our best to effectively answer these kinds of questions, so read on. Between summer’s heat and winter’s chill, trees tend to lose plenty of nutrients within the soil. Like most living things, trees need to prepare for the cold of winter and the lack of vital nutrients they will receive. In order to help them out with this process, consider laying down a slow-release fertilizer onto your trees. This will help your trees continue to be healthy over the winter, in addition to helping the trees resist diseases, inclement weather, and pests. Winter pruning is common practice, because it is when most trees are dormant. Come springtime, trees will burst forth with life. For reference it’s best to prune once the worst of winter has come and gone, even though it can be difficult to discern when exactly that is. Summer pruning is more for slowing growth in particular areas of a tree or bush. Fall pruning, generally speaking, shouldn’t be done. Decay fungi tend to spread spores much more widely and rapidly during Autumn, and with that in mind, trees take longer to heal from the cuts you may apply. Hence, just forget about fall pruning (until it gets much colder) unless you seek out the council of tree maintenance experts, like those of us at Growing Earth Tree Care! It’s not a bad idea to give a little extra water to your trees before they go fully dormant. Do this before the soil freezes. Likewise, insulating the base of your tree (without suffocating it by making it flush with the trunk) with a bit of mulch can also promote health for the tree. A good rule of thumb here is to lightly place the mulch about three inches deep. Think of it like a nutritious blanket for your tree! For more specific questions, we recommend either scouring the internet for more detailed answers (although there is no guarantee of that information’s veracity) or contact your local tree doctors in Growing Earth Tree Care. Our tree services include tree removal, tree pruning, pest control, soil and root care, and more. If you are interested in getting a free estimate for tree care services, reach out to us today. We at Virginia’s Top Rated Local Tree Care Experts would love to hear from you and help make your yard as healthy as possible!